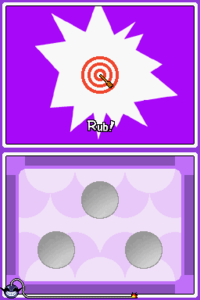 Scratch and Match is a microgame found in the Dance Club Rub stage in WarioWare: Touched! It returns as one of Wario's Touch League microgames in WarioWare Gold. The objective of the game is to rub and scratch the circles on the bottom screen to find the red circle (or Wario in WarioWare Gold), shown in the top screen (the bottom screen in Gold). 1st level difficulty: There are three circles to rub. 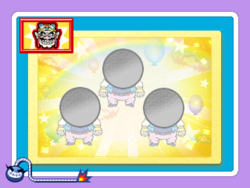 In WarioWare Gold, the characters behind the circles use Wario's body. 2nd level difficulty: There are four circles to rub. In WarioWare Gold, the characters ride on geese. 3rd level difficulty: There are five circles to rub. In WarioWare Gold, the characters appear to be on cups. This page was last edited on October 13, 2018, at 19:42.